Mig points out that Paul Morphy's grave is undoubtedly under several feet of water. If you have the means, I encourage you to join me in contributing to the Red Cross 2005 Hurricane Relief Fund. It's the least we can do. ...Dinesh D'Souza describes how he got taken for a ride on the streets of San Francisco. Though "no Gary Kasparov," D'Souza is "a decent enough player" who "can usually give the bums a fair game." While playing for $5 he was "measurably ahead" after 15 minutes. " 'I'll be right back,' my opponent excused himself. 'I have to take a [expletive deleted].' He made his way to a nearby hotel visible from the street." Well, a few minutes later one of the spectators pointed out the obvious to D'Souza: The guy wasn't coming back, and D'Souza wasn't getting his five bucks. Back in the early 90's I had a six-month consulting assignment in Washington, DC and lived in an apartment in Dupont Circle during the week. I checked out the hustlers in the Circle on many occasions but never mustered the courage to sit down for a game. I've also never played in Harvard Square, though I have watched several times. One might think that I've decided that the best way not to be hustled is not to play hustlers, but perhaps it is more accurate to say that I prefer to be hustled by club members I know (through entry fees) than by strangers. I see that Susan Polgar has changed the name of her blog. It is now entitled "Susan Polgar Fun and Informative Personal Chess Forum." ... film-maker Guy Ritchie's fierce rivalry with close friend and leading man Jason Statham can only be settled one way - with a game of chess. Ritchie, 36, has just finished shooting [the] upcoming movie Revolver - his third film with The Transporter star - but they continue to battle it out for supremacy behind the camera. Ritchie, who is married to Madonna, jokes, "Apart from the fact I don't like him, don't trust him and have no respect for him as a chess player, Jason and I work well together." Statham adds, "Our relationship exists on competition, whether we're playing chess or beating each other up, we're always trying to get one up on each other. "But the toughest moment is getting Guy to pay his debts when he loses at chess." See my related post "A place where everyone knows your..."
Please take a moment this evening to pray for the people of New Orleans. While no chess connection is necessary, you may want to think of Jude Acers. It is unlikely that the Gazebo will survive the storm. GadgetryBlog has a somewhat derogatory post promoting a giant backyard chess set... but as you'll read, the commenters have the last laugh. This Saturday the 12th Annual Charles Drafts Open is being held at the Boylston Chess Club. Charles died several years ago and so for newer members of the club and the broader readership of the weblog I thought it might be worthwhile to briefly review his story. You probably don't want to have a discussion about this, at least not with your wife or girlfriend. Dr Irwing told The Times the differences "may go some way to explaining the greater numbers of men achieving distinctions of various kinds, such as chess grandmasters, Fields medalists for mathematics, Nobel prize-winners and the like." See also my previous post "Chess and Intelligence." The 9th Mind Sports Olympiad is currently underway at the Manchester Conference Centre in Manchester, England. Competitions are taking place in Abalone, Aquire, Age of Steam, Backgammon, Boku, Bridge, Carcassonne, Chess, Continuo, Creativity, Cribbage, Decamentathlon, Diplomacy, Dominoes, Draughts, Entropy, Go, Historical Games, Intelligence, JKLM Taster, Lines of Action, Lost Cities, Mastermind, Mental Calc, MSO-Con, Nubble!, Othello, Oware, Pacru, Pentamind, Poker, Puerto Rico, Quiz, Rummikub, Settlers, Skat, Speed Reading, Stratego, Triolet, Twixt, and Victor Ludorum. I suppose for a change of pace the club could hold a combined Chess/Age of Steam tournament (Age of Steam? I wonder if it has anything to do with those manhole explosions in the North End). Here's the schedule of chess events. Don, the original Man de la Maza and co-founder of the Knights Errant, wrote to inform me that he discovered that he and DreadPirateJosh are members of the same Virginia chess club. There's going to be less scoring here than at a chess tournament after party. Tyson: "My favourite move is getting more pieces." Billy: "I like taking all the pieces." Master: "The best thing about chess is saying 'checkmate'." September: "I like sacrificing a piece." Clayton: "I like staying in motels." Read "Chess masters aim to keep calling out 'checkmate'" from Hawkes Bay (New Zealand) Today. You may or may not like their views on international relations, but you've got to love their chess blogs. 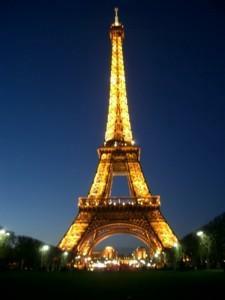 France produces blogs with a style all their own. We've previously seen the various efforts of GM Chabanon; now I'd like to introduce Chess Collector. Photos, Problems, Amateur Game Scores, Cool Graphics ... Fantastique! And for the mono-linguists among us (myself included), Google actually does a half decent job of translating Chess Collector into English. Can a Class A player benefit by joining the Knights Errant? I have just finished what will probably be my last tournament at the Marshall Chess Club tonight, and I am ending it with a bang-- I beat three 2100 players and lost a tough tough fight against a master to win the 2nd place prize, a 2300 performance rating, a personal best! Those who have been reading this blog may recall that last time I posted, I was bemoaning my many chess losses in recent months, a losing streak in which I lost 9 of 10 games and almost 100 rating points. While it may be premature to say that I have recovered from my slump, my rating at least has climbed to the 2nd highest point ever. But I am not posting to gloat-- I am posting to inform. Desperate for a clue to my losing woes, I took a long hard look at the last 50 of my recent games. I discovered something that should have been obvious-- almost all of my games were losses due to tactical mistakes. I was getting strategically superior positions, but I was 1) missing tactics that simplified the game to a win, 2) missing my opponents' tactical chances 3) misplaying my own tactical opportunities (e.g. I would see that I have a pin, but I wouldn't properly take advantage). Also, because I was blundering so much, my confidence in my calculations was horrendous, and I would sink into time pressure again and again. Having been an avid reader of this blog, I was familiar with the De la Maza method that has spawned the Errant Knights group of chess bloggers. The idea is simple-- to improve from a class player to an expert, do 1000 chess problems in 64 days, then start over and do them all in 32 days, then 16 days, etc. until the whole set is completed in one day. When I read about this, I thought that plan for improvement sounds great for a Class C player, but maybe would only offer diminishing returns to a Class A player. After all, I've built up to the A class on my tactical skill, no? Well, no. First, all those tactical opportunities I had in all those games -- all wasted! Second, I picked up a book, GM Emms' "The Ultimate Chess Puzzle Book," with 1001 puzzles, and I started doing the easy section at the front. I was shocked--shocked--shocked-- to discover that I got several wrong out of the first easy pages!!!! Other "easy" ones took me several minutes or more. If I skipped ahead to the harder ones, I couldn't even find the tactical IDEAS to begin solving the puzzle. I had discovered my problem at last. It wasn't a problem of psychology, not an issue of stamina, not a question of being relaxed or nervous. No! During my last few years of chess study, I have been focusing on opening, middlegame, and endgame play, with signs of improvement there. I was capable of making plans. I knew where to put my knights and how to fight for squares. During all that great and useful and interesting study, my tactical brain had shrunk. And that is how I have become a Knight. I am still on circle 1, but I have done more than 600 chess problems in the last 3 weeks and am on pace to finish the set in the 64 alloted days. It is a struggle at times, but I can already see the difference in my approach, the depth to which I can calculate, the speed at which I see trapped and hanging pieces. So, thanks knights.I'll keep updating people on my progress. And to answer the question of the headline-- a class A player CAN benefit from De La Maza's program. Only time will tell as to how much. Even though I admitted that I was succumbing to irrational paranoia in my earlier post about blog visitors from the Middle East, some (well, J'adoube to be specific) suggested that I had finally gone off the deep end. Not so fast, I say! The federal government is investigating whether terrorists could be posing as homeless. ...the cause for concern developed in Somerville after a homeless man was seen hanging around in Davis Square and an MBTA station. Police said they became concerned when they saw him walking back and forth in front of the Social Security Building in Davis Square and looking in the windows. "A false address was given, the address was to a restaurant in Davis Square. When asked for identification, the police were given an expired passport to a country on the FBI's list of interest," said Somerville Mayor Joseph Curtatone. What does this have to do with chess and the BCC? The address of the Social Security Building in Davis Square is 240 Elm Street. Now take a look at the upper right hand corner of this page and look for the address of the club. That's right, we are located in the same building! It's certainly scary enough to consider what might happen to the club if the Social Security Building were targeted for attack. But what if they have another target in mind -- a local of establishment dedicated to forbidden activities? Was anyone else, on seeing that all the Oompa-Loompas are played by Deep Roy, filled with urge to shout ‘Speed Chess!’ whenever they appeared on screen? The Computer History Museum in Mountain View, California is opening an exhibit on the History of Computer Chess. It's been a while since Bablefish Dutch has graced the pages of this blog. Today, we get to turn the tables on our friends from the Nederlands. Since one and a half week we have been on office in the pauses for playing chess; we heus Competence Center - Customer Care Center have set up tournament! Were in the beginning, however, were just as get used; already complete, but after a couple parties no longer have long played (2x loss, 1 x remise) now nevertheless also won! Be now nevertheless entirely into Chess and weerga themselves but again be absorbed in the tactic! I added The Closet Grandmaster and Ginsta's Chess Blog -- both as a result of the "give a link, get a link" rule. I would certainly encourage you to make The Closet Grandmaster a frequent read. It is definitely one of the better new chess blogs I have come across recently (you've probably noticed that I've linked to it frequently over the past few weeks). Ginsta also looks interesting, though he hasn't posted since the end of July. Here's hoping he starts posting again so his stay on the sidebar isn't short. GM Maurice Ashley's blog lost its place -- he's simply not posting often enough. You can now find him under Other Chess Blogs. Among the Knights, Vic seems to have disappeared in a permanent (404) way. And while I didn't make any changes today, I am concerned about Knightwiz, Sliver Dragon and Zeon - The Paradoxical Knight who have all been quiet for awhile. Are you guys out there? On the structural side, I've turned Classic Chess Blogs into a post rather than a separate sidebar section. I also added an Essential Chess Links section, mostly for my own benefit since I visit these sites frequently (though, I'm certain many of you do too). At My Life as a...Gas Station Attendant, Gas Guy writes about The Master -- a story of chess and the true meaning of life. 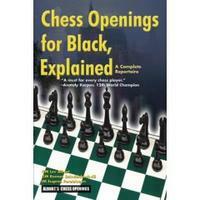 On the evening of Wednesday, August 24th, the BCC has invited IM Eugene Perelshteyn to deliver a lecture on material from his new book "Chess Openings for Black, Explained." If you have difficulty with the Black pieces (and who doesn't) or like new chess books (and who doesn't) you shouldn't miss this one. Eugene is an extremely strong player and an excellent coach and teacher. He will be bringing copies of his fantastic new book which will be available to buy and to have signed. You won't want to miss this one! When: Wednesday, August 24th, 7:00 p.m. Drawing from his freshly-published work on the openings for Black, IM Eugene Perelshteyn will present an overview of topical openings and their usage, provide some pointers on how to study openings, and give us the inside story of the writing of the book. Recently graduated with an M.S. in computer science from UMBC, IM Eugene Perelshteyn is back home in Swampscott, Massachusetts where he is pursuing the GM rank in international chess competition and a career in computer science. As captain of UMBC's Chess Team since 1998, he led the University to five outright or shared world titles, two consecutive years as champions in the "Final Four" of College Chess, and also represented the United States in various World Junior Chess Championships. Eugene now holds two GM norms and a FIDE rating of 2507. 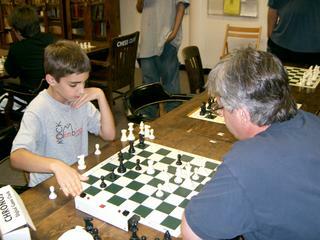 His other past accomplishments include 1st at the Generation Chess International (over GM Ehlvest, GM Christiansen, et. al. in 2003), U.S. Junior Champion (1999), New England Champion (1997), and Massachusetts State Champion (1996). Check out Chess.fm for an audio interview with Anand. According to the site it is available for download between August 17-24. Here's a photo from The Closet Grandmaster's 2005 Doeberl Cup set. Are you a beautiful woman and think you can help a geek? Are you a geek and want to help a beauty? · Beauties and Geeks willing to work together and compete for the opportunity to win a substantial cash prize!! We will be outside the AU BON PAIN restaurant meeting chess players and their friends, this Saturday, August 20th between 3:30PM and 5:30PM. Hope to see you there! Snafu, Inc., 3 Ball Productions, Inc., Katalyst Films, Inc., Flashlight 21 (collectively, “Producer’), and The WB Network (“Network”) make no guarantee that applicants will be selected for participation in the audition process and/or the program presently-entitled “Beauty and the Geek” (the “Program”). Producer is under no obligation to conduct auditions and/or to produce the Program. By submitting your application, you acknowledge and agree that: (i) Producer has no obligation to produce the Program, and, if produced, neither Producer nor Network has any obligation to broadcast the Program, even if produced; (ii) all decisions by Producer and/or the Network concerning selection of the contestants for the Program are final and not subject to challenge or appeal for any reason; and (iii) Producer has no obligation to return any materials submitted by any applicant as part of the application process, whether or not such applicant is auditioned and/or selected as a contestant. Any material provided to Producer (including, without limitation, videotapes, photographs, etc.) and all material that Producer creates as part of the application and contestant selection process shall remain the sole property of and shall be freely assignable by Producer. If you submit an application and/or any materials for consideration as a contestant on the Program, whether or not you are selected for any further consideration as a contestant on the Program, Producer shall have the right to use your name, voice, likeness, appearance, biographical information, any information or material provided by you to Producer, and any motion or still pictures or recordings Producer may make of you, in any and all media now known or hereafter devised, worldwide in perpetuity, and you hereby release Producer from any and claims, actions, damages, liabilities, losses, costs and/or expenses arising out of or resulting from Producer’s exercise of its rights hereunder. Your rights and remedies against Producer shall be limited to the right, if any, to recover money damages in an action at law, and you shall not be entitled to terminate or rescind any agreement between you and Producer or any of the rights you grant to Producer, or to enjoin or restrain the development, production, distribution, advertising or other exploitation of the Program or any rights therein. My free web stats provider, Site Meter, launched a new feature this week that is pretty cool. Called "World Map", it plots the most recent visitors to the site (up to 100 for a non-paying member like me) on a map of the world. You can also focus in on specific continents. When you roll over the dots a pop-up displays the IP address, city and country of the visitor. You'll be able to locate some of the more frequent visitors to BCC Weblog from places like New Brunswick, Fort Lee, Broken Arrow and Amsterdam (you know who you are!). So yesterday I was playing around with "World Map" and noticed that in my last 100 visitors I had one from Iran and one from Egypt. Of course, both these countries have well developed network infrastructures so it is certainly no surprise that people are surfing the web there. Nevertheless, I could probably count on one hand the number of hits those two countries have generated over the entire life of this weblog. So I thought I might dig a little deeper and that's when things just got weird. It turns out that both visits came from the same referral source - an MSN search for "DG". It's interesting enough that BCC Weblog makes the first page of results for this search (it doesn't on Google or Yahoo!). It's even more interesting to note that before this no visitor had ever come to the site through this keyword. Just what were these people searching for -– Data General?, Deutsche Grammophon?, Dollar General?, DG Systems? -– and why did they both choose to click the link for BCC Weblog? Now I generally consider myself to be a fairly rational person. While it's true that Iran is a primary sponsor of international terrorism and that Al Qaeda's Ayman Al-Zawahiri comes from Egypt, I realize that the vast majority of people in both countries have nothing to do with these activities. While it's true that some Shiite leaders have insisted that chess is forbidden, it's hard to imagine that they are collecting information on individual chess bloggers. Nevertheless, in this case, I've decided to err on the side of irrational paranoia. So just in case something untoward occurs, please point the authorities to this post. And if they say it was accident, don't believe them! The inaugural season of the U.S. Chess League begins on August 31st with teams representing eight cities battling it out over the next three months for chess supremacy. 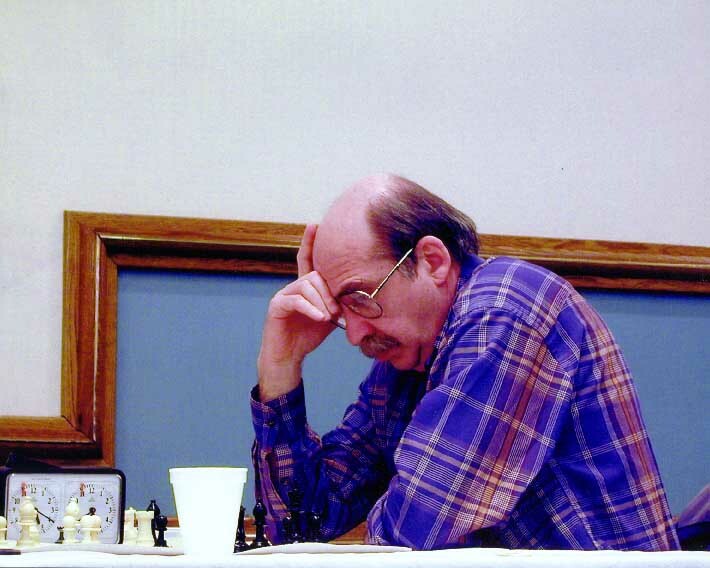 The local entry, The Boston Blitz, features Boylston Chess Club member GM Larry Christiansen. The BCC is also represented by club president FM Paul MacIntyre (who is also team captain) and board member NM Charles Riordan. Filling out the roster are local players IM Igor Foygel, IM Eugene Perelshteyn, IM-elect Josh Friedel, and NM Lou Mercuri. The games will be played at the MetroWest Chess Club, where team manager Matt Phelps will be handling the necessary computer hookups. Visit the site and follow the action. Go Boston Blitz!! For the second time in my chess career I have achieved a USCF OTB rating four digits long beginning with the number two. The first time I reached these heights (April 1999) my stay was shortlived and I regret to report that my performance in this year's Reubens Landey virtually assures the same outcome this time around. Nevertheless, I will savor the moment while it lasts. It's sort of like Halley's comet -- catch it now, or wait years for the next opportunity. "Not everybody plays baseball or football or bowls, but there's darn few people who haven't fished," Brown said. Tempo went out to the lake by his house and hooked a new Knight. Maverick Philosopher is playing in the 2005 U.S. Open. You can follow his adventures here. On a few occasions I've spent a Friday evening at the Waltham Chess Club; however, this looks like it would be a lot more fun. 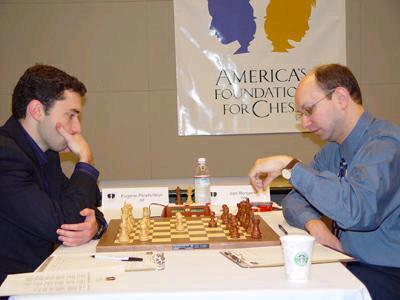 The Chess Journalists of America (CJA) announced their 2005 prize winners on August 10th at the U. S. Open Chess Championships in Phoenix, Arizona during the annual CJA meeting. My acceptance speech -- well, it's going to have to wait. 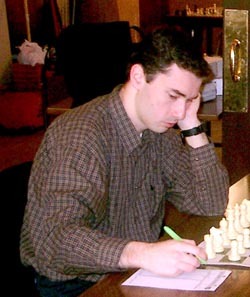 Chess Horizons Editor Mark Donlan submitted my article "2004 Boylston Chess Club Championship" (based on content from my blog of the same name) in the Best Magazine Tournament Report category. The bad news is that I was beat out by articles written by Mig and Tim Redman; the good news is that I received an Honorable Mention (see category 14). I can imagine the judges reviewing the submissions: "Mig, Redman, Heisman, uh huh; Kavalek, Shabazz, Nunn, sure; DG...who the heck is this guy?" Further down the list, you'll see that our occasional Guest Blogger Howard Goldowsky won the award for Best Editorial. Congratulations! This leads me to a bit of editorializing of my own. Two years ago the CJA finally caught up with the new media trend by introducing internet-based award categories. This was certainly a major step forward in recognizing the role the web is playing in communicating chess-related information. In fact, I would be inclined to argue that web-based chess journalism far exceeds print at this point in time (at least in quantity, if not quality). Yet, the current CJA internet categories are rather limiting given the broad range of web-based chess content being produced. For example, Michael Goeller had no better choice than to submit The Kenilworth Chess Club site under the Best General Website category. While he had little chance of winning in that category, I suspect he would have been a very strong contender in the unavailable Best Chess Club site category. More importantly (and I'm sure you saw this coming from a hundred miles away), there are no categories for chess blogs. In fact, had 2004 Boylston Chess Club Championship not been adapted into a print article, there would have been no logical category to submit the site to (they don't even have a Web-Based Tournament Report category). Surely sites like Mandelamaza and The Chess Mind deserve the opportunity to receive recognition for the quality chess journalism they represent. As a start, I would like to encourage the CJA to reevaluate the web-based award categories. Specifically, I believe -- at a minimum -- a Best Chess Blog category should be added. Should we be lucky enough to achieve this objective, in the future they might even consider sub-Blog categories, e.g. Best Chess Improvement Blog, Best Chess Analysis Blog, etc. I like the sign the best, though the "chess attendant" in referee stripes is kind of interesting. 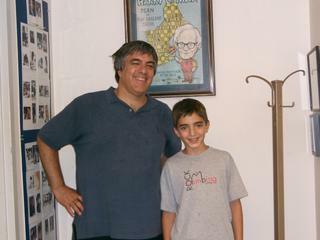 Chess in Chicago named Eric Rosen (chessdude64) their August 2005 Chess Kid of the Month. The BCC connection? In the article they used the picture of Eric and his Dad (chessdad64) which I took when they visited the club this month. Regrettably, the BCC didn't get a mention nor the photo a credit. Oh well, that's life in the Wild West Web. 9. "I can't believe it. This is where Hochtuey Sheshmed went to school before he became northwest Nepal semi-regional chess champ. I-have-arrived!" It's good to have black belt karate masters as friends. Oh yeah, I edited out his humor indications to make him sound more fierce. When Stephen Chess sells the last commercial condo in Union City's Chess Commerce Center, his legacy will remain in the abstract form of a king, queen and pawn splayed across a chess board. Although he says it was a "dog-and-pony show" to meet Union City's requirements for public art, Mr. Chess has become quite attached to the 6-foot-tall display visible to all who drive down Kohoutek Way. Even if the 19 new owners decide to change the name of the three-acre development, he's pleased to note that those three chess pieces that mark the entrance aren't going anywhere. Read "Chess pieces helped make him a player in commercial condos" from the San Jose Business Journal. You can be sure that some of these kind words from Goran Urosevic (of Chess News and Events) about BCC Weblog will find their way onto the sidebar. The Reubens Landey is part of the BCC championship cycle. The winner earns a place in the fall championship played among the club masters. See also my previous post "How did you find out about the Club?". I know that's what they say, but what do you suppose Susan Polgar's reaction would be to this headline on Gawker Media blog Kotaku's coverage of her world record-breaking simul? The Jewel Royale (Chess Set) Company Limited and jewelry partner Boodles is currently finalizing the commissioning of the design and production of The Jewel Royale Chess Set - a gold and platinum gem encrusted chess set and board valued at some US$9 million. Constructed in gold and platinum, this single chess set will be set with diamonds, emeralds, rubies, sapphires and pearls. ... Other Chess Blogs: En Passant and The Closet Grandmaster. In Tuesday's attempt, [Raemon] Thomas stood on a sink and used a king from a chess set to punch his way through the ceiling, Wilson said, adding that he thought the effort took place over the course of several days. Read "Detainee, 15, tries to escape from Shuman Center" from the Pittsburgh Post-Gazette. 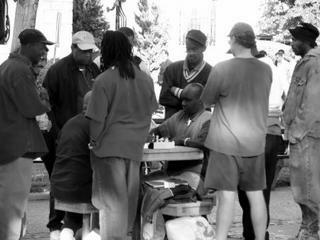 An article about the scene around the chess tables on Market Street in San Francisco -- more street, than chess. I found this link over at Chess Pundit and DreadPirateJosh -- not our old friend BlueRook, but BlueEyedRook. 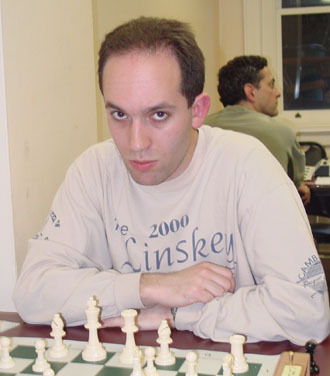 ...And here's one from The Kenilworth Chess Club's Blog page -- Peter Dove's Chess Blog. Speaking of The Kenilworth Blog page, it now provides listings comparable in scope to mine with the addition of small blurbs describing the background and/or content of each. A very worthy resource, though I suspect it will be difficult to maintain the timeliness and accuracy of descriptions as blogs become inactive or change their focus. Maybe it's something about the internal solitary experience of playing chess; or, maybe it's the overly competitive attitude which comes from the unwavering effort to "kill" the opponent. In any case, it seems that chess players are often extremely skilled at making their points in ways which are unlikely to endear them to others. He follows a chess improvement program which is superior to De La Maza's, but which he needs to keep a secret so his potential opponents can't use that knowledge against him [DG: What percentage of games between Class B players do you suppose are won/lost due to opponent research?]. While doing tactics is part of the program, unlike De La Maza's, his program doesn't make the mistake of actually having you solve the problems. He is so brilliant that his coach sought him out and doesn't make him pay for lessons [DG: Presumably the prestige which comes from having Quandoman as a student is more valuable than mere money]. Sure seems like the kind of guy that would be fun to go out and have a beer with -- not!